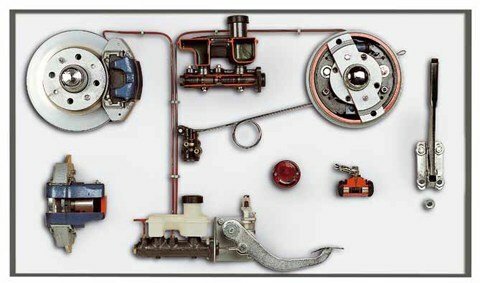 Wall panel representing a double circuit braking system. As in real conditions, it is operated by a hydraulic pump connected to the disc brake and a drum brake. A braking adjuster is placed between the pump and the (rear) drum brake in the circuit in order to avoid the rear wheels locking during the braking phase. The same devices used in the circuit have been sectioned and added in the panel to clearly show their operation.